(RxWiki News) When a pregnant woman experiences pain, fever or inflammation, it's important for her to know what medications she can safely take. A recent study found that most NSAID medications, such as aspirin and ibuprofen, do not appear to increase the risk of miscarriage. The study only looked at risk of miscarriage, so it could not assess whether these medications might be linked to other issues for pregnant women or their babies. One medication classified as an NSAID, called Indocin (indomethacin), was found to be linked to miscarriage. 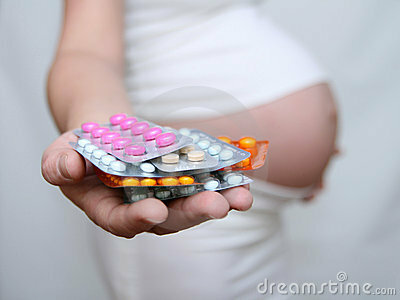 "Ask your OBGYN about safe pain relievers during pregnancy." The study, led by Sharon Daniel, MD, MPH, looked at whether taking nonsteroidal anti-inflammatory drugs (NSAIDs) might lead to miscarriage. NSAIDs are commonly used medications that can reduce pain, fevers or inflammation. They include aspirin, ibuprofen and naproxen – all available over the counter – as well as other medications. The researchers compared the 65,457 pregnant women who were admitted to the same hospital in Israel between January 2003 and December 2009. Among these women, 9.9 percent experienced a miscarriage, and the other 90.1 percent gave birth. The researchers looked at all the women who had taken NSAIDs during their pregnancies – 6.9 percent of the total group – to see if they had a higher likelihood of experiencing a miscarriage. In doing their calculations, the authors took into account other differences among the women that might influence their risk of miscarriage. Those differences included the following: the woman's race, age, past miscarriages, use of in vitro fertilization (IVF) and use of a intrauterine contraceptive device (IUD birth control such as Mirena). The researchers also took into account whether the women were obese, had diabetes, had hypothyroidism, had a blood clotting problem or smoked. When the researchers considered NSAIDs as a group in general, they did not find any higher risk for miscarriage among the women who took them compared to those who didn't. Then the researchers looked at specific types of NSAIDs. They found that women who had taken indomethacin (brand name Indocin) while pregnant appeared to have almost three times higher risk of miscarriage. They did not find a link to miscarriage among any other specific medication. "We found no important associations between exposure to NSAIDs, either by group or for most specific NSAID drugs, and risk of spontaneous abortion," the authors wrote. "The fact that the study was based on large proportion of the district population, was adjusted to nearly all known risk factors for miscarriages (tobacco use, obesity, IVF, uterine malformations, hypercoagulable conditions, intrauterine contraceptive device etc.) and used advanced statistical methods strengthens the validity of the results," they wrote. The researchers did find that one group of NSAIDs, called "selective COX-2 inhibitors," possibly increased the risk of miscarriage slightly (a 1.4 times higher risk), but this finding also could have been due to chance. Further, most COX-2 inhibitors, which included Rofecoxib, Bextra and Vioxx, are no longer available. The only COX-2 inhibitor currently available in the US is Celebrex. More research is needed to know if this group of NSAIDs is linked to miscarriage. However, Andre Hall, MD, an OBGYN at Birth and Women's Care, PA in Fayetteville, NC, pointed out that despite this study's findings, NSAIDs such as Advil and Motrin are still not recommended during pregnancy. "NSAIDS as a group are generally considered to be contraindicated in pregnancy except under very specific circumstances," he said. "NSAIDS, among other things, have been shown to decrease the amount of amniotic fluid by decreasing kidney perfusion and function." The important thing, then, is communication between a woman and her doctor, Dr. Hall noted. "The take home message here is that all patients should discuss the pros and cons of various medications prior to taking, especially when pregnant in order to be able to make an informed decision as to how they wish to move forward," he said. The study was published February 3 in the Canadian Medical Association Journal. The research did not receive outside funding from any company or organization, and the authors reported no conflicts of interest.